In chemistry, fats are called lipids. There are three main types of lipids; triglycerides, phospholipids and sterols. Most of the fat we eat is in the form of triglycerides, so for this blog post I’ll be looking specifically at these. 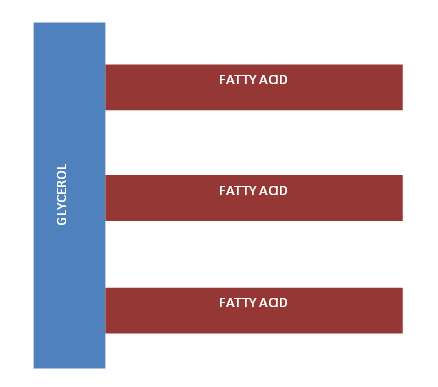 The fatty acid chains can be saturated or unsaturated, this describes how the molecules in the fatty acid are joined together. Saturated fats have no double bonds, unsaturated fats have at least one double bond (as seen in the bottom fatty acid chain above). Generally speaking, saturated fats tend to be solid at room temperature and are from animal sources. Unsaturated fats are liquid at room temperature and tend to come from vegetable or plant sources. Fat provides energy; around 9 kilocalories (kcals) per gram. It’s important that we have some fat in our diet because it’s needed to transport and aid absorption of fat soluble vitamins. Fat also provides vitamins A, D and essential fatty acids that cannot be made by the body. However, too much fat can lead to weight gain and put us at risk of health problems in later life. There are three main types of fats; saturated, monounsaturated and polyunsaturated. Most foods contain a mixture of all of these, but usually one type of fat is present in larger quantities than the others. There are also trans-fats, these are a specific type of unsaturated fatty acid. Trans-fats are found in low levels in some foods but are also formed in food manufacturing. Saturated and trans-fats are less healthy, because they bring about an increase in overall blood cholesterol levels. Foods high in saturates include; fatty cuts of meat, butter, cream, cheese and pastries. Trans-fats are formed when oil undergoes a process called hydrogenation, the hydrogenated fat can then be used for frying or as an ingredient in processed foods. We should all try to have less saturated and trans-fats in our diet. Saturated fat can be reduced by choosing leaner cuts of meat or trimming off the fat, using low fat dairy products and grilling or poaching foods rather than frying or roasting them. As the negative effects of trans-fats have become more evident, their use in food manufacturing has declined. As a result, most people eat under half the recommended maximum of trans-fats, so saturated fat presents a much bigger problem. However, it is still worth checking labels and choosing oils that do not contain hydrogenated or partially hydrogenated vegetable oil. Mono and polyunsaturated fats are better for us as they can help lower blood cholesterol. Sources of monounsatured fats include olive oil, nuts and avocados. Polyunsaturated fats can be found in rapeseed oil, sunflower oil, oily fish and nuts. However, a fat is still a fat and to prevent gaining too much weight and increased risk of diseases in later life we shouldn’t eat too much of any type of fat – even the ‘good’ ones! So how much fat should we eat? Current recommendations state that no more than one third of our daily energy should come from fats. This works out at between 50-100g of fat per day depending on your nutritional requirements. Of this, less than 10% of our daily total energy intake should come from saturated fats (around 20g for women and 30g for men) and no more than 5g per day of trans-fats. Fat and saturated fat content of most food items can be found on the food labels. Generally speaking, choosing plant sources of fat that contain mono or polyunsaturates where possible is best for heart health. But we should try to prevent over-consumption of any type of fat in order to prevent weight gain. …Part 2 of ‘FATS’ explores fat makeup of different oils and spreads; which ones we should choose? I’ll also be looking at omega-3, omega-6 and the facts behind coconut oil. ← What is a Dietitian?